Using nothing but a bale of hay, a bowler hat and a whip, some amazing sound effects'and superb physical and vocal dexterity, Masterson, brings Orwell's allegorical masterpiece vividly to life in an unforgettable tour-de-force peforrmance. Peppered with contemporary political buzzwords which add a modern sinister relevance, Orwell's central message of betrayed idealism and abuse of power is hammered home, leaving an indelible imprint on the consciousness. This brilliant adaptation gets to the heart of Orwell's barnyard classic, maintaining his original textual structure and style in a powerful multi-character performance that makes the book accessible and exciting. "What an amazing storyteller! I have been familiar with the works of George Orwell since my days at school and Animal Farm was always a favourite. The political satire has lost none of its punch or relevance. Listening, and watching, Masterson's one-man retelling was like being introduced to this story for the first time! "UK performer Guy Masterson is a staple of the Adelaide Fringe and Animal Farm is a staple of Guy Masterson's solo-performance catalogue - alongside his one-man Under Milk Wood. Seventeen years ago, Masterson adapted the play - from George Orwell's classic novel; an allegory for the Russian Revolution and the Stalinist Era - and it, like the novel, is still a powerful piece. Animal Farm tells the tale of the Manor Farm and the ignored and mistreated animals who, after being informed of a dream of revolution by Old Major, are moved to revolt. Over time, under the rule of Napoleon, the Berkshire Boar, the ideals of the revolution come to naught, returning the farm to a state of oppression. On a stage, bare except for a bale of hay, we are introduced to the "cast" of Animal Farm - all individually portrayed in vocal and physical detail. From the thundering power of Boxer the Clydesdale, to the more genteel Clover and the prancing mare, Molly - she with the 'red ribbons in her mane'. Then there are the ruling pigs: stout, firm and oppressive Napoleon and the sly, manipulative - and aptly named - Squealer. There's also, initially, the fair-handed pig, Snowball, who is ousted and whose memory is corrupted - much like the 'Seven Commandments of Animalism'. A highlight - one of many - is the loopy portrayal of the sheep. With crossed-eyes, flapping hands and a lolling tongue, Masterson portrays these moronic followers as the namesake for mindless servitude. Central to the extension of this one-man piece into a theatre-filling experience is the lighting. The stage lights vary from tight spots to full stage, blindingly bright to dark and dim, from hot summer sun to freezing winter depths - and a lighting finale that has to be seen to be believed. The soundtrack, too, is pivotal - from the moment you enter the theatre to the sounds of Pink Floyd's Animals, to the collective animal sounds that enhance the stable's environs and the none-to-subtle collection of modern political extracts. This soundscape flows from the speakers and washes over the audience - signifying the myriad animals and the atrocities of martial law. Masterson gives his all - and it shows in the sweat-soaked coveralls he wears - as he moves, seamlessly, from character to character and creates a world populated with politically-motivated, driven and downtrodden animals of all shapes and sizes, great and small. Originally conceived as a two-act play, it has been condensed into 95-minutes - which fly like the old raven, Moses. "Guy Masterson re-enacts George Orwell's satire on Communism with panache and brings vigour and a distinctive feel to each character. His performance is remarkable in this part narrative, part enactment show and he has a hold on the audience from start to finish. The set is a bale of hay, but the simplicity juxtaposes the dramatic and violent story that unfolds. Old Major's dream of an animal utopia where all animals are equal and live out the course of their lives as nature intended fuels the rebellion against humans led by the pigs, Snowball, Napoleon and Squealer. Masterson is faithful to the novel and enacts each scene shifting dexterously between characters, adopting their distinct characteristics and mannerisms. For two hours he is a bundle of energy and intrigue playing out the story. After the successful rebellion against Farmer Jones and the other humans on Manor Farm 'Animalism' is established and the seven doctrines adapted from Old Major's opening speech. All of the animals are happy and work together under the leadership of the pigs. However this Golden Era does not last long when boorish Napoleon overthrows Snowball's rule and the circle of tyranny continues as the pigs increasingly resemble humans. In true Masterson style his performance and talent fires the audience's imaginations to set the scene and accompany him on a journey to the murky depths of human nature. With a few sound and light effects the mood is conveyed and ambiance established, but all eyes are on Masterson as he shuffles, leaps, squeals and grunts on stage. "I'll admit that I was entirely dubious about a one-man show of a story entirely about animals - the logistics just seemed too complicated to be a success. But Guy Masterson's solo take on Orwell's classic Animal Farm quelled those doubts within minutes. Masterson is an incredibly talented performer. Through the use of clever and simple changes in his body language, such as a closed fist indicating a pig's hoof, he was not only able to suggest successfully to the audience a wide range of different animals present, but also give each of them depth of character. Each pig, while clearly a pig, was also able to be an individual - it was never difficult for the audience to tell characters apart, which, in a one-man show is a total triumph, especially without the assistance of any costuming. 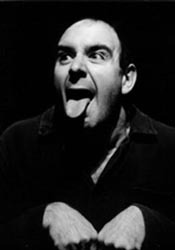 Often, Masterson also adopted the role of a narrator, which added a level of humour to the play and allowed him to connect more easily with his audience. The narrator's dialogue often evoked dramatic irony, Masterson sharing something with the audience that the animal characters did not yet understand. He also manages to connect the ideas and themes of Animal Farm to present day, through brilliant use of sound clips and references from the narrator. These subtle references made the story much more relevant to the audience without having to transplant the entire story to present day. "Guy Masterson! There is a lot in a name. In this 90-minute tour de force he plays every character, all of them materialising within minutes of the opening dialogue. A horse, a pig, a sheep, a bird, a plane, it's actually, there are no planes; but he is superman. This is no simple re-telling of the Orwell classic tale of despotism. This adaptation is firmly rooted in our time, where a social democracy is hollowed out and corrupted by a secretive authoritarian kleptocratic capitalism that, step by step, distorts and inverts all the principles its contributive believers hold dear.
" Masterful Storyteller, Guy Masterson's genius lies in his ability to simplify theatre. To make it accessible and enjoyable. Who could imagine Dylan Thomas' Under Milk Wood as a solo show before Masterson? So after doing the impossible once, he opted to try again with George Orwell's Animal Farm. He achieved his goal. The book, originally titled Animal Farm - A Fairy Story, was a savage attack on Joseph Stalin and his control of communism. It was such an effective allegorical tale set against the excesses of The Soviet Union, the C.I.A. paid for the film version in 1954, with a few of their own modifications to ensure a politically correct version was released to the public. That's become the version the public has come to know, but Orwell was a better writer than that and Masterson brings the tale back to it's original Orwellian truth. Animal Farm is a full frontal attack on the noxious art of political betrayal. With the Soviet Union long gone a post-Cold War generation are able to see this production with fresh eyes and a more honest approach. The notions of Masterson's Animal Farm are easily related through our own time and place of Keynesian economics having been usurped with the mantras of Economic Rationalism. Masterson-s set couldn-t be more simple - a bale of hay centre stage. His costume is just as simple - a pair of blue overalls (soaked in sweat by the end of the performance). The lighting and sound effects are also simple. But what isn't simple is Masterson's interpretation. It-s engaging and dynamic for the full 95 minutes he's on stage. He brings out the humour of the piece and introduces minor updates to add to the relevance for a contemporary audience. GUY MASTERSON BRINGS ANIMAL FARM TO FORMIDABLE LIFE IN SOLO PERFORMANCE "Guy Masterson, as theatergoers who have attended the annual British Invasion know, is a visceral performer - aggressively physical, facially pliant and vocally versatile as he ranges from falsetto to bass. He brings all those attributes to George Orwell's Animal Farm, which he has adapted as a two-act solo performance. Working with nothing more than a bale of hay at center stage and exactly two props, Masterson brings Orwell's political allegory to life with formidable performance skills. Masterson's physical solidity suggests that he could carry a piano on his back without much strain, but he's light on his feet. Grace and delicacy are as important as strength and bulk in this performance. George Orwell (nee Eric Blair) wrote his novella in the 1940s as an explicit criticism of Soviet communism and dictator Josef Stalin, who had betrayed Marxist ideals with his ruthless police state. The book suggests that any revolution will be corrupted because nobody and resist the intoxicating allure of power and privilege. The Soviet Union passed into history, of course, but police states still seem to be a thriving industry in some parts of the world. Masterson's performance makes clear that Animal Farm still has plenty of relevance at a time when our political system appears irredeemably dysfunctional and many of our politicians have mastered Orwellian rhetoric. The narrative depicts an animal rebellion on Manor Farm. The humans are pushed out and the animals take charge of their own affairs. All animals are equal, according to the new principles of Animalism, and any creature that walks on two legs is inherently bad. But the pigs teach themselves to read and become the new ruling class, eventually trading with humans at neighboring farms, rewriting the rebellion's history, imposing rigid rules on the other animals, enforcing politically correct thinking and hoarding the best food for themselves. Masterson embodies - and clearly delineates - the various characters vividly: Napoleon, the ruling pig; Squealer, his chief propagandist; Boxer, the hard-working (but not very bright) draft horse; Benjamin, a donkey who views the machinations of pigs and humans with equal skepticism, and many others. The social tapestry is rich as Masterson portrays horses, cows, attack dogs, sheep, goats and the occasional human. Masterson takes his audience on a real emotional and intellectual journey. The show is by turns inspiring, exciting, frightening, mournful and poignant. But it also shows us that Animal Farm is an allegory worth revisiting and leaves us with couple of inevitable questions: Does human nature really change? At the end of the day, aren't we animals too? "Animal Farm, a novel written by George Orwell and first published in 1945, reflects the period of Russian history from the fall of the monarchy, through the rise of communism to the Stalin era. However, the book is also an allegory for the cyclical nature of politics and the damaging effects of bad leadership and ignorance of the masses. The latter meaning of the book is where Guy Masterson's production takes off; it is packed with contemporary references to British politics and makes links to dictators and regimes throughout history, while still calling back to communist Russia. The production not only stays true to Orwell's original masterpiece but genuinely (and sympathetically) adds to it allowing its relevance to blossom. This was a one-off performance requested by Assembly to celebrate their 30th Anniversary, in itself an indication of the high regard in which Masterson is held. There was an audience of two- or three hundred and the excitement was tangible: the last ever (ever, ever) performance of this famous rendition of Animal Farm. The show has a long history, being premiered at the Traverse theatre in 1995 and subsequently toured all over the world. Yet, in principle, it seems to have changed very little in that time; the stage is empty bar three hay bails in the centre and the performance takes the form of Mastserson hosting and narrating, acting and enacting, the entire book over two hours. Sounds like a recipe for disaster - one man, one book, two hours. However, as has been proven time and time again, this show is infinitely entertaining, utterly captivating and, in its own way, very poignant. Masterson introduces the main characters at the beginning: Boxer, the hard-working, loyal horse who ultimately gets bitten by the system he has spent his life supporting; his companion Clover; Napoleon the cruel dictator (who is a pig of course) and his cronies and rivals, Snowball and Squealer. Each character has a unique voice and physicality which masterfully represents not only their animal qualities, but their human ones too. For example, to portray Clover, Masterson bends over, bows his head and shifts from foot to foot, just like Boxer. However, his in-turned knees and out-turned hands manage to betray the humble, bashful and gentle side to Clover's character. Over the course of the two hours Masterson commands the stage. He leaps, rolls, cartwheels, barks, grunts and bleats whilst effortlessly leading the audience along through the narrative and clearly presenting the underlying messages. The sounds effects are made by Masterson's voice; to create the sound of group mutiny different snippets of his noises are played simultaneously creating a chaotic, rather creepy effect. The lighting design is equally effective, ranging from yellow and whitish general spreads to an intense red front light creating an iconic and propagandistic shadow of Masterson on the back wall. The technical elements were the only short fall of the show as there were several missed or incorrect sound and lighting queues. However, the nature of the performance allowed Masterson to easily progress from pig-dictator, to narrator, to actor, and the audience were all the more supportive and impressed for it. The show ended on a powerful image; Napoleon on the top hay bail, standing on two legs, with a grimace so hideous and pig-like as to send a collective shiver down the spine of the audience. "Guy Masterson's Animal Farm is an incredibly energetic and frightening theatrical experience. "Guy Masterson skips on to stage barefoot and clad in Yakka overalls to present his one man adaptation of George Orwell's 1945 classic novel, directed by Tony Boncza. It's bareboards theatre with the only prop a single bale of hay at centre stage. And Masterson certainly fills every inch of the space with his enactment of animal body language. He is at times pig, horse, chicken, cow, bull, sheep donkey, goat and raven. He kicks an invisible shed door open, leaps about the stage in the joy of animal victory, gazes in awe at the luxury of Farmer Jones's house and raises a trotter in triumph and solidarity. He squeezes laughs from the audience as Squealer the pig and amazement as the cartwheeling Boxer and later pathos as the loyal and hardworking old horse grinds to his inevitable and tragic demise.